Mile Marker never stops in its innovations. The company has a large selection of products to offer off-road enthusiasts and professionals. Among them, there is Mile Marker 76-50246BW SEC9.5(es) Truck/Jeep/SUV element sealed electric winch – 9,500 lb. This is one of the great solutions for those who prefer safe adventures. Let’s discuss the main features of this winch presented by one of the most reputable American brands – Mile Marker. The winch is equipped with the 4.8 motor of the wound series, which provides smooth performance, Another feature that contributes to the perfect operation is the 3-Stage Planetary with the gear ratio 212:1. There are power-in, and -out remotes. The winch has rollers, which are coated with Dacromet. The pulling power 9500 is sufficient to pull out from anywhere! The winch has a corrosive proof design, which makes it reliable and durable. Be sure that buying this winch you get if for the long period of time. It is not afraid of snow, mud, and water being completely waterproof, snowproof, and even mudproof. The winch looks innovative thanks to the no chrome construction. You will definitely like its zinc clutch handles and tie bars made of aluminum. The winch has the top-notch quality coating, which is resistant to corrosion. The innovative design has been invented for the solenoid as well. Now there are marine-grade connections. This ensures that the device will perform all the functions you need. As it has already been mentioned, it has a sealed element and is completely waterproof. 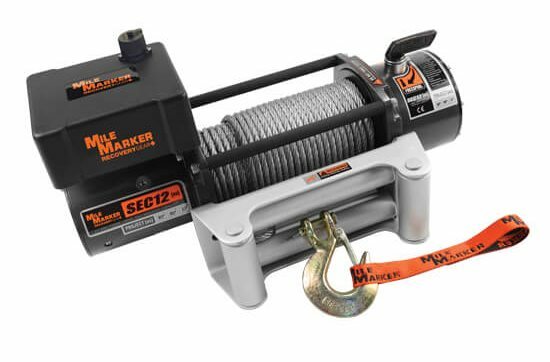 Besides, there are many other things you can benefit from if buying this winch. Among them, there is a clickable gear housing, black hawse fairlead, load holding brake, and fast line speed. You will enjoy an easy installation process as the winch is versatile and can be used for Truck/Jeep/SUV. You will be able to enjoy the superior quality design of each part, which not only looks great but also performs its functions the best way. I have got this winch because I consider Mile Marker the trusted brand. All my friends have winches of this brand and say that they never fail when pulling out of mud or snow. I have checked its performance only once so far and I was 100% satisfied with what I got. I liked how fast it worked and helped to pull out my SUV.